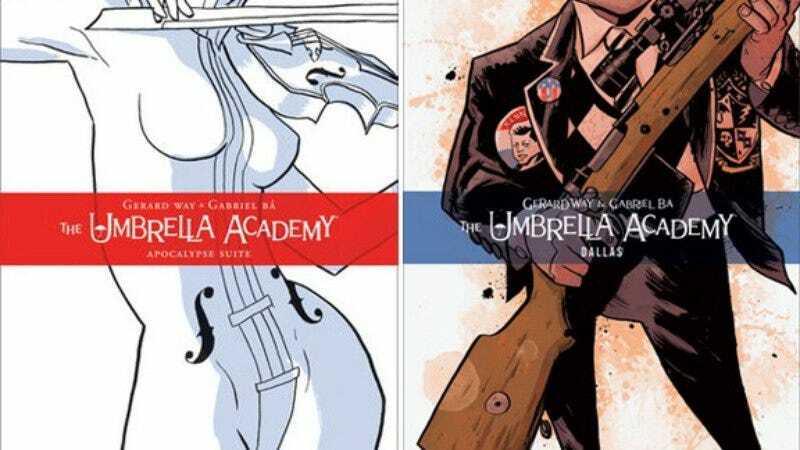 Some of Dark Horse Comics’ most highly regarded original comic book properties, including Gerard Way and Gabriel Bá’s breakout hit The Umbrella Academy, might be making their way to TV soon. That news comes courtesy of a new deal between the comics publisher and Universal Cable Productions, giving the studio first-look rights to Dark Horse’s extensive library of characters and titles. Although best known for its stable of licensed comic adaptations—including decades worth of books set in the Star Wars universe—Dark Horse has pushed hard to develop and acquire original brands in recent years. Those titles include Paul Chadwick’s Eisner-winning Concrete, Cullen Bunn and Tyler Crook’s horror comic Harrow County, and Umbrella Academy, which centers on a team of dysfunctional superhero siblings who are forced to reunite after their distant father figure’s death. All three titles are now in development via the deal, along with Back Up, an original screenplay about technology that allows people to “save” past version of themselves to restore in the case of their deaths.